If you dress in your finest piratical or hobo threads, you save 2 bucks at the door and can be part of the fun! February 26 – Saturday pm – Hotel Utah, San Francisco with Shark Alley Hobos and Brian Belknap. Oh, what a night it will be! We are pleased to say that our special sponsor for the evening is Kraken Black Spiced Rum. Details to come about special rum drinks. 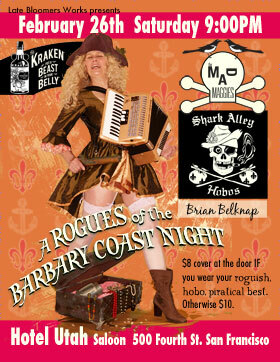 Brian Belknap, Hotel Utah, kraken, live music, Pirates, rum, San Francisco, Shark Alley Hobos, the mad maggies.